Grif on Stage—Looks just like me. Original Grif CD exclusively on my site for $8.00! Jump to the Album link here to get it. Welcome to the home of Grif Bamaisin. 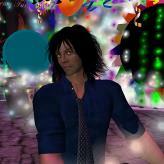 I am a musician playing in Second Life. If you don’t know what Second Life is, go here. I’m a Brit who came to the US in 1977, currently living in Portland Oregon . I play guitar, bass, keys, and can create sounds from most instruments using a sequencer. During my shows I play and sing live over backing tracks I created myself. I often use a looper instead on conventional backing tracks so I am free to adapt to my audience and build music on the fly. I perform live pretty much every night in Second Life, mostly at regular timeslots and venues—check out the gig calendar for details. I also play special events and will do benefits for organizations I believe in—Relay for Life, Toys for Tots are a couple of charities I support in world. My music consists of a selection of original material and some eclectic, relatively unknown covers. Mostly rock and blues, but I also play a few smoochie songs, ballads, acoustic numbers and even a little reggae. Mostly I play what I enjoy hearing. When I cover a song, I tend to play it the way I feel it and not as it was originally. During shows I will play live guitar, sing live, and occasionally some live bass and keyboards. This site is a work in progress, just like me. Please email me at electricbrit@grifbamaisin.com if you are interested. Thanks. Check out my first music video! I was stunned and amazed to find over 100 videos of me out on the web—here they are. (If you are on a smartphone you can go here. Grif gets 15 Minutes of Fame! On October 20th, Steve Griffiths aka Grif Bamaisin was featured on the front page of the Living Section in Oregon’s main daily newspaper, the The Oregonian. Here is a link to the article. There is also a video about half way down the article. You can see the video below.